WaterColor is the ideal beach community for families and WaterColor was specifically designed with family lifestyle and activities in mind. Erin Oden and Coastal Luxury specialize in the listing and sales of WaterColor real estate. The master-planned community of WaterColor, immediate neighbor to the community of Seaside, is a coastal resort located along South Walton, Florida’s popular beach road of Scenic Highway 30A and is bordered by the Gulf of Mexico, Western Lake, two state parks and the community of Seaside. WaterColor’s location is prime, approximately 16 miles East of Destin and 17 miles west of Panama City Beach in Northwest Florida, a close distance to Panama City International Airport, Destin Airport, and Valparaiso Airports. WaterColor consists of four phases, which house the smaller 27 WaterColor neighborhoods. The community of WaterColor is defined by the wide variety of family activities and amenities and is in its essence the perfect family beach town. WaterColor offers high architectural integrity and design with coastal beach houses of muted colors with the intended charm and Southern traditions of small town beach days gone by. Families seen bicycling throughout the streets is a portrait of all who know WaterColor. Covered porches front the pedestrian-friendly, tree-lined streets, and houses are characterized by deep roof eaves, clapboard and shake-sided walls, and crisply framed windows maximizing natural light. Carriage houses and garages are perfectly situated on the rear alleys of the home, with attention away from vehicles as this community encourages biking, outdoor living, and family time. The vast amenities of WaterColor lend families best experience available along Scenic Highway 30A, whether for vacationing or living. Focused on the enjoyment of both adults and children of all ages, there is wonderful variety, including Town Center, the Gulf-front Beach Club, the Boat House on Western Lake, the Tennis Center, Camp WaterColor, four pool areas and ample green park space. Town Center in WaterColor boasts the liveliness of its shops and eateries, with condos above these merchants. There is a scarce amount of Gulf-front homes and condos in WaterColor, and the gulf-front locations are highly coveted and are also in a desirable close proximity to Town Center. The Gulf-front Beach Club is also in Town Center, offering the enjoyment of a gulf-front pool as well as casual food and drink service. The popular Fish Out of Water restaurant sits between the Beach Club and the award-winning WaterColor Inn and Resort, recognized in 2008 with a World’s Best Award from Travel + Leisure. 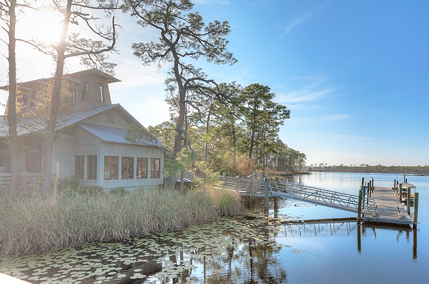 WaterColor Boat House is on Western Lake, the largest of 11 coastal dune lakes along Scenic Highway 30A’s Beaches of South Walton, and provided water activities. Canoeing, kayaking, paddle boarding can all be enjoyed. The BaitHouse Restaurant offers a lake-front dining experience. Enjoy a tennis match on one of the five Har-Tru Hydro Courts at the WaterColor Tennis Center, also features a stadium court. The WaterColor Tennis Center features a pro shop of quality selections and also accommodates night tennis with lit courts. Camp WaterColor is perhaps as popular among adults as it is to their children, offering a fun-filled day camp and an onsite outdoor amphitheater lawn, swimming pool, playground, and field. Kids enjoy daily arts and crafts, games, nature lessons, beach outings, swimming, movies at the Camp WaterColor outdoor amphitheater among their activity-filled days. Everyday needs are readily available at WaterColor Crossing shopping center, with a Publix Supermarket and UPS Store, restaurants, nail salon and boutique shops. Golfing is available in close proximity at the Tom Fazio-designed Camp Creek Golf Club on Scenic Highway 30A just a short trip east of WaterColor.